now on sale for $30 plus shipping! 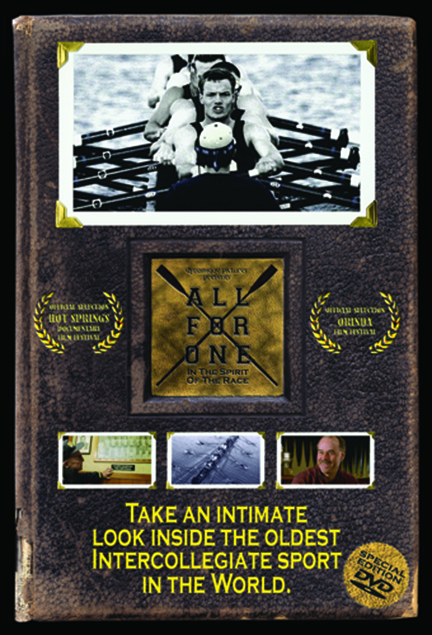 ALL FOR ONE: In The Spirit Of The Race has screened in theaters and film festivals around the World, including the Hot Springs Documentary Film Festival, the Orinda Film Festival, the West Newton Cinema in Boston, and the Pacific Film Archive in Berkeley. If you missed your chance to catch it on the big screen, now is your golden opportunity to add it to your home, club, or university library. This DVD is formatted to play on U.S. & Canadian DVD players (NTSC), but in consideration of our growing international audience its 'All Region'. This means while it won't work on your International DVD players (PAL), it will play on virtually any computer in the World. Please keep in mind that this is dvd is a limited edition, and stock is running low. Once it's gone, it's gone for good, so order now to guarantee you'll own this important piece of rowing history for generations to come.